Have you ever wondered what a Western bluebird likes to eat? 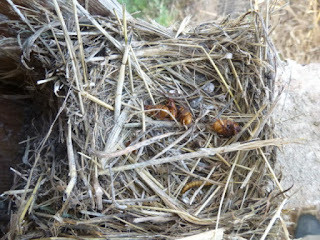 As seen in the picture, June bugs are one of their preferred choices. The picture below was taken by Lee Pauser and it brought a large smile to my face. June bugs lay their eggs near the end of May/ early June and they age into grubs. The grubs then munch on roots making the turf weaker and the turf eventually gets torn up by hungry crow, skunks, or racoons. We have over 100 Western bluebird boxes on the course and it would be great to see them all like this!